2018 Mill Creek Farmers Market. Photo credit: Lesley Van Winkle. The Mill Creek Farmers Markets will also be open a bit later to accommodate people with jobs, from 3:00 pm to 7:00 pm. Last year the hours were from noon to 5:00 pm. 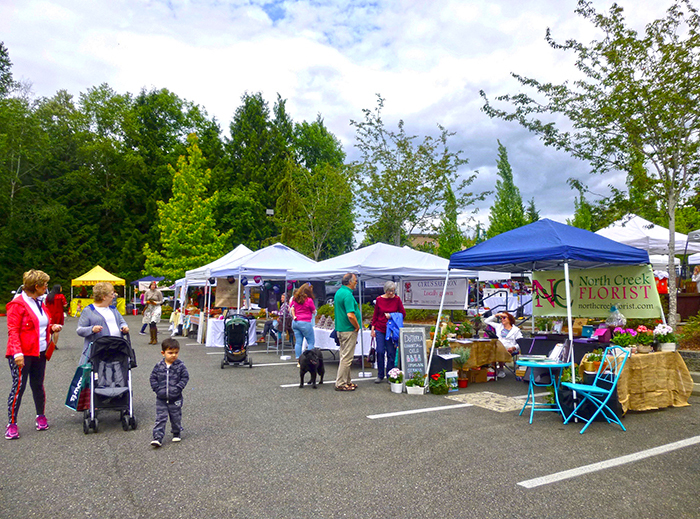 The first Mill Creek Farmers Market this year will be held on June 18th and will again be located in the Mill Creek City Hall North parking lot. Since there are no public rest rooms in the Mill Creek Town Center or adjoining shopping centers, the location also allows farmer’s market visitors to use the public rest rooms at City Hall North. Jensen said she plans to work with many of the same vendors from last season and hopes the day and time shift will attract more farm-fresh goods.